Did you know that I’m totally a sauce person? I just love to dip, dunk, and pour. I like to dip my pizza in blue cheese dressing. I pour salsa verde all over my tacos. I put barbecue sauce on my baked potatoes. I have a problem. Maybe I’ve burned the crap out of my taste buds too many times, but I’m the type of person that prefers to have as many different flavors as possible in a dish. Sauces helps me make this happen. It’s so simple to make and provides a solid amount to pour all over everything and/or freeze for later use. Dollop big spoonfuls all over a grilled steak! Pour a jar into a crockpot with some frozen meatballs and take it to a friend’s house to watch the game! Same as number 2 but with chicken wings! Same as number 3 but with cocktail weenies! Add a sweet and spicy kick to a polish dog! 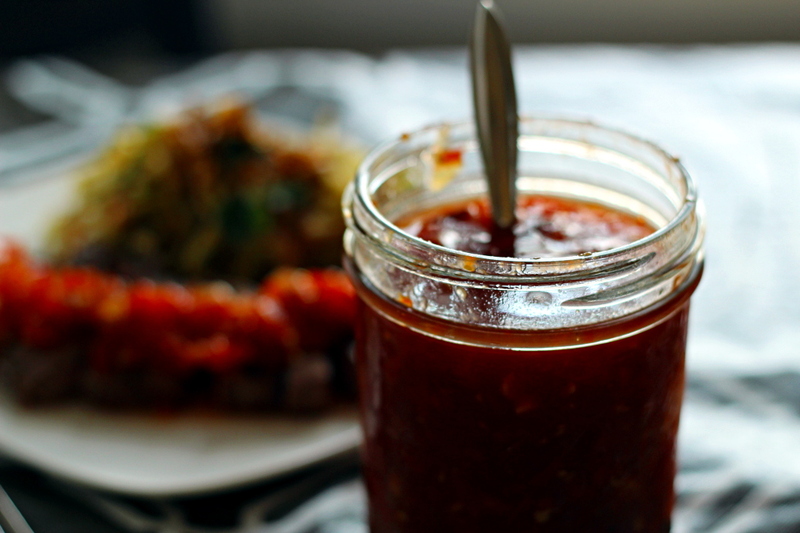 Use it as a salad dressing along with some crispy wonton strips! 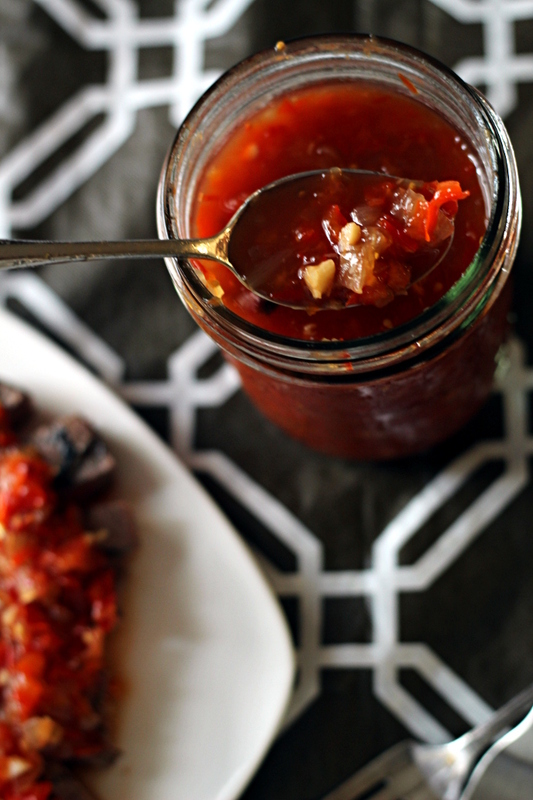 Serve as a salsa with tortilla chips! Dip your egg rolls in it! Pour it on your ice cream! Okay, that last one is a joke. 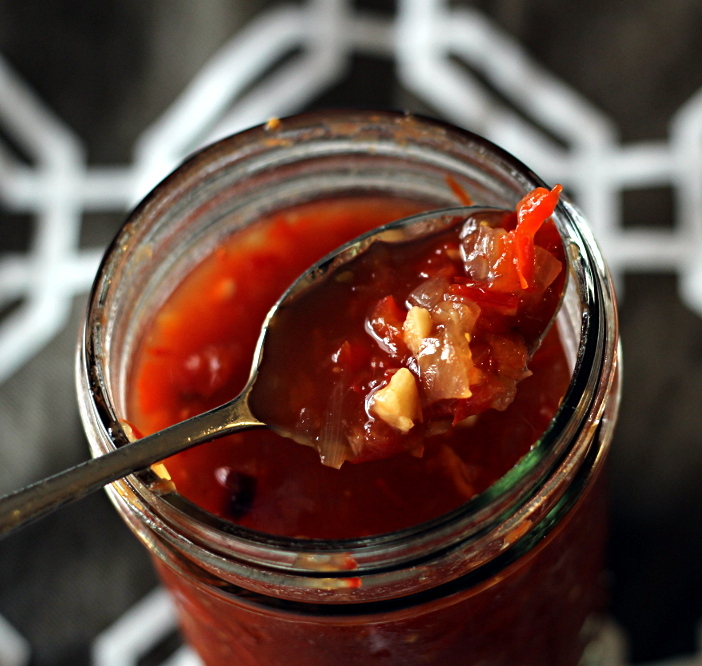 I think you catch my drift – there’s a lot of things you can do with this sauce, so it’s a great thing to keep in your freezer for emergency situations. Are your taste buds ready for a party? Heat a large cast iron skillet over medium heat. Once hot, dry-fry (meaning, don’t add any fat or oil to the pan) the whole chilies for one minute, then set aside in a small bowl. They should be fragrant and slightly darker in color, but not burnt. In the same pan, dry-fry the chopped onion, bell pepper, and garlic for 2 minutes until brown but not burnt, then set aside on a large plate. Toss in the tomatoes and dry-fry for 1-2 minutes until charred on the outside, stirring frequently. Set on the plate with the onions, pepper, and garlic. Turn the stove off, then use your hands to break apart the chilies into smaller pieces. Don’t try to use a knife, because they will fly all over the kitchen. Place the chilies in the bowl of a blender or large food processor, then wash your hands thoroughly with soap and warm water to remove any oils left from the chilies. Add the third cup fish sauce, quarter cup lime juice, and sugar to the blender, along with the reserved onion, bell pepper, garlic, and tomatoes. Pulse on “chop” mode or equivalent until the mixture forms a chunky sauce. Serve either warm or chilled. Sounds wonderful on just about anything, well maybe not the ice cream.LOL! I am heading out to get the peppers in a moment...Heck I even already have the fish sauce in the fridge! Will this hold well in the fridge? I want to make it up as a gift for my brothers. Maybe I could freeze it? Awesome!It keeps in the fridge for about a week, but any longer than that and I'd definitely freeze it. Honestly, I think it tastes better after a few days in the fridge because the flavors have a chance to mingle. I just thawed a jar that I'd had in the freezer for a few months and it tasted like I had just made it!